As countries liberalize their FDI regimes and firms increase their investment activities across national borders, maintaining the proper functioning of markets assumes increasing importance. Freer flows of FDI mean a greater reliance on market forces to determine the volume and distribution of FDI and its economic impact. Countries, especially developing countries that are liberalizing rapidly, are therefore interested in ensuring that the reduction of regulatory barriers to FDI and the institution of standards of treatment are not accompanied by the emergence of private barriers to entry and anti-competitive behaviour of firms. Competition and competition policy in relation to FDI need, therefore, to be better understood. Part Two of WIR 97 focuses on the relationships between FDI, market structure and competition, and considers policy implications arising from these relationships, especially as they concern developing countries. The discussion of these issues rounds out, therefore, discussions in previous Reports, of FDI liberalization and related regulatory frameworks, including those relating to international investment arrangements. The ultimate objective of FDI liberalization is to enhance economic growth and welfare in countries. Success in this respect depends not only on increasing FDI flows — and the capital, technology, managerial know-how and market access associated with them — but also on ensuring that the industries and markets in which TNCs participate operate efficiently. In market-based economies, the efficient functioning of markets depends on the contestability of markets — or the ease with which firms can enter and exit them — and the extent and nature of competition in markets. Foreign-direct-investment liberalization, by removing formal barriers to the entry of FDI, can increase the contestability of national markets and inject greater competition into them. However, because of the ownership-specific assets of TNCs, their transnational organizational structures and the relatively greater competitive strengths that they often have vis-à-vis domestic firms, FDI could also increase concentration, and TNCs could indulge, like dominant firms generally, in restrictive or anticompetitive practices. Government policy and practices aimed at attracting investments that grant exclusivity or allow firms, domestic or foreign, to erect informal impediments to the entry of other firms could contribute to the potential for such practices. … through the adoption and implementation of competition policies. Governments rely on several policy tools to ensure that their markets remain contestable and that competition in markets is maintained as far as possible, so that economic growth and welfare are not adversely affected by the inefficient allocation or use of resources. The tools of such policy include trade policy, FDI policy, regulatory policy with respect to domestic economic activity, and competition policy. While the first three comprise rules and regulations that serve several purposes and not only that of maintaining competition with a view to fostering efficiency, the last relates specifically to the rules and regulations — implemented by competition authorities — with respect to arrangements among firms/suppliers and the conduct of individual firms/suppliers, generally but not exclusively, in national markets. It is increasingly recognized that consistency and coherence between the different policies — some of which, as mentioned above, could serve competing objectives — are important. This is reflected in the fact that, in many developing countries, trade liberalization, FDI liberalization and domestic deregulation are currently taking place simultaneously. This ensures that the contestability and competition introduced by one set of policies are not undermined by another; but it also makes the pain of adjustment to competition, especially for hitherto protected domestic firms, a problem requiring attention and action by governments. Even as barriers between national markets are reduced and producers can locate anywhere in the world (or in a region) to transact with buyers also located anywhere, the markets for many products remain national in scope. These include markets for products that can only be delivered through the presence of the producer at the location of the buyer — notably, services — and markets in countries that have significant restrictions on trade. The interaction of TNCs with the structure of these national markets, the process of competition and the performance of firms and industries within host countries all therefore continue to be of interest, especially for developing countries. The opening up of economies to inward FDI can contribute directly towards increasing the contestability of — or potential competition in — host country markets. Sellers participating in these markets can now include not only domestic producers and (in the case of goods and tradable services) exporters from other countries, but also TNCs from other countries that establish affiliates (as well as contractual arrangements with other firms) to produce in and for local markets. Furthermore, TNCs, with their ownership-specific or competitive advantages, are often better able than domestic firms to overcome some of the cost-related barriers to entry that limit the number of firms in an industry and the market for its products. This potential for increasing competition by allowing FDI entry is particularly important for many service markets, in which competition through arm’s length international trade is not possible or is limited. Transnational corporations typically participate to a greater extent in industries that are more concentrated, at the national as well as the international level. This is largely due to the fact that industry concentration and the competitive advantages that enable firms to become transnational share common causes. However, inward FDI, when it takes place, can itself affect the concentration of producers in a host-country industry and, hence, of sellers in the market for its products. The nature of this effect depends, initially, upon whether or not the mode of entry is such as to add to the number of suppliers (and the quantity supplied) in a market and, subsequently, upon several factors related to the relative size, competitive strength and mode of competition of foreign affiliates and domestic and other firms competing in a market. In developed host countries, on balance, these factors are likely to be conducive towards reducing market concentration — or, at least, not to increase concentration. In developing economies, the picture is more complex. Although the mode of entry of FDI into developing economies — generally, greenfield investment — is conducive to reducing concentration, market concentration has often been found to increase. Several factors may be involved: the disparity in size between foreign affiliates and domestic firms; the greater production efficiency or sales capability of foreign affiliates (which can lead to the exit of domestic enterprises that have yet to build up the necessary capabilities to withstand international competition, or to their merger with foreign firms); the use of modes of competition that are new to host country markets; the introduction of new products for which no other local producers or substitutes are available; and, most importantly in the case of tradable goods and services, restrictions on international trade that give local producers protected markets. If there is a sizeable number of domestic firms that have accumulated some competitive strengths and/or the capabilities to learn from foreign firms, increased concentration is less likely. Similarly, the presence of imports can curb the possible dominance of foreign affiliates in a market. The increasing role of small and mediumsized TNCs and TNCs from developing countries, with sometimes smaller competitive advantages compared with those of large TNCs from developed countries, is also likely to contribute towards lessening the tendency towards greater concentration of host country markets in industries with substantial inward FDI. … and influence the performance of firms and industries — and, ultimately, consumer welfare — accordingly. The production efficiency of foreign affiliates is often higher than that of domestic firms in host developing countries. The implications of this for welfare in the host economy depend upon whether competition is maintained when FDI takes place, and markets work efficiently. If competition — between foreign affiliates themselves, between foreign affiliates and importers, and between foreign affiliates and domestic firms — is lacking, and foreign affiliates operate in highly concentrated markets with low contestability, the benefits to consumers from the entry of more efficient TNCs, in the form of lower prices, improved quality, increased variety, as well as innovation and the introduction of new products, may be limited. In addition, there may be scope for TNCs to engage in anticompetitive business practices that serve to keep new entrants out or result in inefficiencies and reduced consumer welfare. In particular, if a host country market remains, or becomes, concentrated after the entry of TNCs, there may be a potential for TNCs to engage in business practices, including restrictive business practices, that could have anticompetitive consequences, especially in markets that are characterized by low contestability. The main types of anticompetitive behaviour include, as in the case of purely domestic firms, collusion among producers/sellers of the same product; monopolizing mergers and acquisitions; exclusionary vertical practices; and predatory behaviour. In the case of TNCs, these practices may sometimes be specifically related to, or facilitated by, the cross-border relationships and contacts that are specific to operating in more than one country. Consumer welfare in host country markets may also be affected adversely if market-power inducements are granted by host country governments to TNCs in order to attract investments by the latter. These inducements include guaranteed exclusive rights of production and/or exclusive rights of sale of a product in the host country market, often supported by protection in the form of prohibitive tariff or non-tariff restrictions on trade. The granting of these inducements has direct anticompetitive effects, with adverse implications for efficiency and the benefits from FDI. Such inducements, like other incentives, are based on the objective of maximizing the long-term benefits (in the form of capital, technology, management know-how, and market access) that FDI is expected to bring; but, given the potential for adverse effects on the efficient functioning of markets, a careful assessment of costs and benefits is necessary if the granting of these inducements is to be justified. In a liberalizing and globalizing world economy, TNCs operate increasingly in markets that are no longer national but regional or global in scope, with transactions between sellers and buyers of a given product from several different countries taking place across national boundaries. In various industries, TNCs take advantage of the widening scope of markets to restructure their operations and/or integrate their value-added activities internationally, either within their corporate systems or through interfirm alliances and agreements, achieving efficiencies in production through functional specialization and economies of scale and scope. The efficiency gains that some TNCs are able to reap through integrated international production enables them to lower prices, to introduce better quality products, or to introduce new products to capture a greater market share. This leads some industries (and markets) to become more concentrated at the regional or global level, a trend that affects all countries. However, concentrated markets at the regional or global levels need not necessarily affect competition, industry performance or consumer welfare adversely. For one thing, such markets are, by definition, more contestable or open as regards entry (and exit) than segmented national markets, simply because sellers (and buyers) from a number of locations can participate in them. Furthermore, when integrated international production (including at the R&D stage of the value chain) for regional or global markets enables firms to overcome the high costs of, and reap the economies of scale and scope associated with innovation in industries with rapidly changing technology, it could actually enhance competition (through innovation), although the number of independent firms that perform a particular function may diminish. Consumers located in different national economies benefit when buying in those regional or global markets. Particularly high degrees of concentration in regional and global markets would, of course, raise competition concerns. Business practices by regionally or globally dominant firms, including TNCs, could affect the continued contestability of the relevant markets and the sustainability of the benefits that the greater openness to FDI and trade is expected to bring. … and can be further enhanced by a quick supply response through FDI. In today’s world economy, a number of factors facilitate the ease and speed with which TNCs can provide a supply response to a change in market conditions — signalled, for example, by a nontransitory price increase — through the establishment of new production facilities to enter a market. These factors are based on the reality that nearly all countries seek to attract FDI, many firms already have foreign affiliates in place, technological developments make the establishment of new affiliates relatively easy and competitive pressures often make the exploitation of new opportunities irresistible. More specifically, the supply response of many TNCs could be rapid, rivalling that of domestic producers and importers in a country because of the scanning capabilities of TNCs; their experience in trade and FDI; their access to resources within and outside their corporate systems, and access to markets; their ability to spread risks and enter into alliances to overcome entry barriers such as those of R&D; and their ability to draw upon existing affiliates for assistance. If supply response through FDI and nonequity arrangements by TNCs is relatively fast — with, say, not more than one to two years elapsing between the identification of an opportunity and the servicing of a market — it would be deserving of attention when considering the degree of competition in a given market. This is particularly important with respect to competition in markets for services, many of which cannot be traded across borders. All this suggests that the speed of the supply response through FDI must therefore be considered routinely — by competition authorities in developed and developing countries alike — when defining the relevant market for a product, or assessing the implications for competition of certain changes occurring in a market. The possibility that new FDI will provide a viable supply response underlines the growing importance of FDI as a factor influencing contestability. Markets may not, however, always continue to remain contestable and competitive. This has several policy implications. The liberalization of FDI regimes facilitates market entry and, therefore, can increase the contestability of markets. As the liberalization process advances, non-traditional barriers that may inhibit FDI are attracting the attention of policy makers. While some of these barriers are due to government measures (e.g., in the case of public monopolies), others — and these are receiving increasing attention — concern anticompetitive private business practices (or restrictive business practices). Some of the latter are normally prohibited per se (e.g., some horizontal cartels or vertical price fixing). The situation becomes more difficult when the practices concerned may have anticompetitive effects but are not considered illegal under the laws of the country in which they occur. While such practices do not necessarily discriminate between domestic and foreign firms, they may nevertheless constitute barriers to competition. regulating prices under certain circumstances. In sum, the inherently anticompetitive nature of market-power inducements calls for their cautious scrutiny. 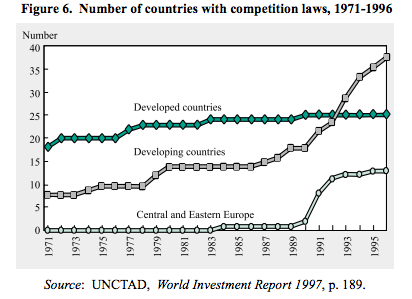 By 1997, some 60 countries worldwide had competition laws (figure 6). Their main objective is to preserve and promote competition as a means of maximizing the efficient allocation of resources in an economy, resulting in the best possible choice of quality, the lowest prices and adequate supplies for consumers. Most competition laws deal with enterprise behaviour by prohibiting restrictive business practices such as competition-restricting horizontal agreements and abuses of dominant positions, as well as certain restrictive vertical distribution agreements. Moreover, an increasing number of competition laws deals with alterations in the structure of markets through the control of mergers and acquisitions, as well as joint ventures, with the aim of avoiding the creation of dominant positions or even oligopolies. Usually such cartel practices as price fixing, collusive tendering and market allocation are prohibited without need for market analysis, while distribution, joint ventures and M&As agreements are assessed in a market context and under a rule-of-reason standard in terms of efficiencies likely to be achieved and passed on to consumers. Competition laws normally apply to all firms operating in given national territories, whether through domestic sales, imports, foreign affiliates or non-equity forms of FDI. (They may also, sometimes controversially, be applied when extra-territorial operations have an effect on those given territories.) They do not, in principle, discriminate between national and foreign firms or between firms from different national origins. In this manner, competition law monitors the competitive behaviour of TNCs having effects in host countries, with a view to ensuring that these firms (like other firms) do not abuse market power. On a wider geographical scale, competition law is intended to prevent inefficiencies stemming from market-allocation agreements designed to lessen trade or investment. Some of these agreements take the form of international market-allocation investment cartels that include promises not to invest in certain markets or not to compete when investing. By their very nature, such cartels directly restrict competition through FDI, typically to the detriment of host countries, and therefore require the attention of competition authorities. The acquiring firm was exporting to a market before it acquired a competing firm in the market, or a foreign firm that already controls one firm in the market acquires another. A foreign firm uses FDI to set up a major plant in a market, another firm does the same, and then the two agree to merge (or one takes over the other), thereby eliminating local competition between their two affiliates. When a foreign firm enters a market by means of a joint venture with a local firm, the issue arises as to whether the foreign firm would have been likely to have entered the market separately and competed with the local firm in the absence of the joint venture. The possibility that the acquiring firm will have an incentive to suppress rather than develop the competitive potential of the firm to be acquired. • The merger of two foreign parent firms can sometimes create competition issues in countries other than the home or host countries of the merging firms, i.e., third countries. A parent firm acquires an enterprise abroad which, as an independent entity, is (or could be) a source of competition for the domestic market. Investments likely to lead to, or augment, worldwide dominant positions. Such cases typically arise in situations in which a transaction affects product markets in which firms compete at the regional or global level. …and in the context of post-entry competition issues. While the liberalization of FDI and trade regimes can be a means of promoting competition, the possibility of anticompetitive practices by firms requires the continuous attention of competition authorities. In fact, even in a national framework in which investment and “trade” are fully liberalized, the possibility of such practices provides one of the rationales for the existence of competition laws. Therefore, while an FDI entry may be unobjectionable from a competition point of view, or even beneficial in itself, it may raise competition issues in the longer term, depending on the behaviour of the firm. For example, competition problems may arise because of restraints that are ancillary to the basic transaction, e.g., when tied purchasing is involved. Joint ventures are particularly susceptible to the combination of a pro-competitive basic transaction and ancillary restraints. Another example, which relates to secondary effects, concerns potential competition problems that can arise if a foreign investor assumes control of an essential facility; competition authorities may have to intervene to require dealing on reasonable terms. Moreover, as transfer pricing can be used for predatory purposes, competition authorities may have to monitor events in this area as well; given the nature of this practice, international cooperation is often required. Finally, corporate non-equity alliances pose new challenges. Certain types of research-and-development alliances, in particular, are attracting increasing attention. Such alliances can have elements of cartelization and, as such, might be subject to competition-law scrutiny. Competition authorities may intervene as regards the structure of a research-and-development arrangement, particularly if parties envisage the joint exploitation of the results. At the same time, such arrangements can have important positive implications for an economy. Many countries therefore exempt certain technological alliances from competition regulations. Where this is not the case, a rule-of-reason standard on a case-by-case basis seems to be increasingly the prevailing approach in judicial reviews, to balance long-term efficiency gains against possible short-term anticompetitive effects. While FDI liberalization can help to enhance the contestability of markets, it is not a sufficient condition: in so far as FDI liberalization creates more space for firms to pursue their interests in markets, competition laws become necessary to ensure that former statutory obstacles to contestability are not replaced by anticompetitive practices of firms, thus negating the benefits that could arise from liberalization. This need increases as liberalization becomes more widespread and extends to new areas. If anything, this underlines that the principal dimensions of the FDI liberalization process (identified in the World Investment Report 1994) are, indeed, inextricably linked: the reduction of barriers to FDI and the establishment of positive standards of treatment for TNCs need to go hand in hand with the adoption of measures aimed at ensuring the proper functioning of markets, including, in particular, measures to control anticompetitive practices by firms. This also underlines something else, namely, that the culture of FDI liberalization that has grown worldwide and has become pervasive, needs to be complemented by an equally worldwide and pervasive culture of competition (which, of course, needs to recognize competing objectives as well). Clearly formulated competition policies and their effective enforcement can contribute significantly to the growth of such a competition culture. In this respect, the trend towards adopting or strengthening competition laws suggests that a competition culture is, indeed, emerging in many parts of the world. However, for countries that are new to this practice, the transition to a more open, competition-oriented system cannot be achieved overnight and involves difficult political choices, the balancing of interests among many stakeholders and the resolving of a host of practical problems. Moving from the plane of competition culture to the plane of policy, this means that competition policy should receive increased attention when it comes to the ideal mix of relevant policy instruments. This should also be the case because, as countries liberalize their investment regimes, they may become concerned that they are moving, for example, from a system of screening all take-overs by foreign firms of national firms to screening none; they may also see risks of foreign firms acquiring dominant positions. Therefore, there is a need to assess the competitive effects of foreign firms at the time of entry and after entry, and that function is increasingly assumed, where appropriate, by competition authorities. Competition policy thus has a major role to play in the process of liberalization, notably by ensuring that markets are kept as open as possible to new entrants, and that firms do not frustrate this by engaging in anticompetitive practices. In this manner, the vigorous enforcement of competition law can provide reassurance that FDI liberalization will not leave governments powerless against anticompetitive transactions or subsequent problems. When formulating their competition policies, countries need, of course, to keep in mind that competition policy is not a substitute for FDI policy and trade policy, but rather that all three are mutually supportive in the pursuit of efforts to ensure that markets function properly. Nevertheless, to the extent that contestability and competition considerations gain in importance in guiding policies, and the more liberal trade and FDI policies become — but, by themselves, do not always lead to contestable markets — competition policy emerges as primus inter pares among policy instruments used to maintain contestability and competition. To make a difference, competition policy needs to be effectively implemented. This requires a strong competition law and an effective competition-enforcement agency, with broad powers to investigate enterprise behaviour and to analyse the competitive effects of concentrative forms of FDI and the competition implications of market-power inducements. Once the basic political decision has been made to adopt and enforce competition policy, the agency should be consulted in relevant contexts, and its enforcement decisions should not be subject to indiscriminate political intervention. Still, it must be recognized that few countries have strong, well-functioning and well-funded competition authorities. And it may well take other countries many years to develop appropriate policies and the institutional set-up to implement them fairly and effectively. This means that, where contestability and competition are the objectives, many countries will need to continue to rely, for the foreseeable future, primarily on FDI and trade liberalization to meet these objectives in the context of closer integration into global markets. The regionalization and globalization of markets and their underlying production structures make it increasingly difficult to define and measure market concentration and to determine the emergence of dominant positions (and the possibilities of abuse of market power inherent in this) in terms of individual national markets alone. Closely related is that the efficiency gains that can be associated with corporate integrated international production systems (including alliances) need to be balanced against any anticompetitive effects of the relevant transactions for the markets supplied by these systems. When confronted with non-trivial and non-transitory price increases, competition authorities need to give more attention to a possible supply response through new FDI by foreign producers not yet servicing a market (in addition to supply responses by established domestic producers and imports). Competition authorities are only beginning to consider explicitly and systematically such new FDI as a normal possible source of supply response. The FDI supply response is particularly important because, in terms of its magnitude, world sales by foreign affiliates are larger than world imports. Perhaps more importantly, FDI is often the only international supply response possible in the services sector. There are numerous reasons why — in an era of globalization — competition issues as they relate to FDI increasingly involve more than one country and, therefore, require international policy responses. Indeed, they are grounded in the very nature of the transnational character of the firms involved, and relate especially to such issues as access to information and the implementation of decisions. However, a number of obstacles make international responses difficult. With respect to the exchange of information, the largest single obstacle is that of the confidentiality obligations of many competition authorities — which they need to have — regarding information submitted to them by various parties. Closer competition-enforcement cooperation is often impeded by basic substantive and procedural differences between the competitionlaw regimes of different countries; in fact, activities being investigated in one jurisdiction may have been encouraged by a government in another jurisdiction. Moreover, many governments simply may not see it in their country’s interest to facilitate a foreign state’s investigation of one or more of their companies. Precisely because of such obstacles, issues relating to competition are increasingly being addressed at the international level, either in the form of separate arrangements relating to some aspects of competition policy or in the context of broader investment and trade arrangements: Bilateral cooperation among competition authorities is growing, although formal agreements are limited to a relatively small number of countries. Most of these efforts involve cooperation on the exchange of information. A number of bilateral agreements go further by establishing ground rules for notification of competition investigations, consultations and cooperation on competition-law enforcement, including commitments for comity (e.g., to take into account whether significant interests of any foreign sovereign would be affected). Cooperation efforts at the regional level often take place in the context of regional integration schemes, which allow approaches and trade-offs that are more difficult to pursue in other settings. The most integrated in this respect is the European Union, in which the member countries have agreed to common competition rules and have a common competition authority. In the OECD, efforts to cooperate on restrictive business practices are not new, with recent recommendations strengthening previous provisions and setting out guiding principles for cooperation. Efforts are also being made within the context of other regional agreements, such as NAFTA, MERCOSUR and the Energy Charter Treaty. At the multilateral level, the UNCTAD Set of Principles and Rules for the Control of Restrictive Business Practices is so far the only multilateral instrument covering all aspects of the control of restrictive business practices. Various WTO agreements also touch upon aspects of anticompetitive practices by firms, including in the context of the General Agreement on Trade in Services, the Agreement on Trade-Related Aspects of Intellectual Property Rights and the Agreement on Trade-Related Investment Measures; the last of these Agreements provides for consideration to be given to whether the Agreement should be complemented with provisions on investment policy and competition policy. Still, the question arises whether, to sustain the regionalization and globalization of markets and production structures, something more than expanded bilateral and regional cooperation is required. Indeed, recent international discussions reflect a growing recognition by the international community of the links between FDI policy, trade and competition policy. This is underlined in particular by the decision taken at the Ministerial Conference of the World Trade Organization in Singapore in December 1996 to establish one Working Group to examine the relationship between trade and investment, and another to study issues raised by members relating to the interaction between trade and competition policy, including anticompetitive practices, in order to identify any areas that may merit further consideration in the WTO framework. As furthermore stated in the Ministerial Declaration, these Working Groups are to draw upon each other’s work if necessary and also to draw upon the work in UNCTAD and other appropriate intergovernmental fora. …while recognizing that the pursuit of contestability does not necessarily always lead to desired outcomes, especially where development considerations weigh heavily. While FDI liberalization can increase competition in markets and thereby contribute to economic efficiency, growth, development and, ultimately, consumer welfare, there are limitations to competition. They arise in particular when markets tend naturally towards high level of concentration and when market outcomes conflict with other policy objectives. In the first instance, limitations can arise from the fact that such natural factors as economies of scale, high sunk costs and high riskrelated costs can make some markets, to a greater or lesser degree, difficult to contest (although technological developments can change the importance of some of these natural factors). One of the antidotes to these natural limits to contestability involves an increase in the size of the relevant market, especially through investment and trade liberalization. Where market enlargement is difficult to achieve, regulations can help to prevent abuses of dominant positions of market power. As countries liberalize their FDI policies, it becomes important to ensure the efficient functioning of markets ... ... through the adoption and implementation of competition policies. While the relevant markets for many products remain national in scope even in a globalizing world economy, ... ... opening up to inward FDI can contribute towards the contestability of host country markets... ... even though TNC activity may decrease or increase market concentration in host country markets, ... ... and influence the performance of firms and industries — and, ultimately, consumer welfare — accordingly. In regional and global markets, competition and efficiency can go hand in hand with greater concentration ... ... and can be further enhanced by a quick supply response through FDI. While FDI liberalization can be a means of promoting competition ... ... the specific task of competition policy is to promote efficiency in a given market,... ... with the main interface between competition law and FDI taking place at entry through merger review ... ...and in the context of post-entry competition issues. There is a direct, necessary and enlarging relationship between FDI liberalization and the importance of competition policy ... ... which, increasingly, also requires that competition authorities cooperate among themselves... ...while recognizing that the pursuit of contestability does not necessarily always lead to desired outcomes, especially where development considerations weigh heavily.